Do you ever recall sitting in a classroom in school and thinking that one or two students were getting the lion’s share of attention when others had things to contribute as well? It seems the world of soft-tissue pain and injury problems shares this metaphor. Take nerve entrapment for example. As soon as you say the phrase upper extremity nerve entrapment, most people’s mind immediately turns toward carpal tunnel syndrome. But there are numerous other nerve compression syndromes that also cause significant pain or dysfunction in the upper extremity. The long thoracic nerve (LTN) originates from nerve roots at the lower cervical vertebra, usually between C5 and C7. Once the nerve root fibers exit the cervical vertebra, they blend together to form the main trunk of the LTN. The nerve then passes between the anterior and middle scalene muscles immediately adjacent to the other major fibers of the brachial plexus (Image 1). 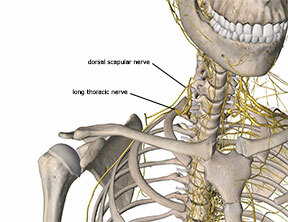 After passing between the scalene muscles the nerve courses between the clavicle and first rib. It then continues down the lateral aspect of the rib cage to its termination at multiple points along the serratus anterior muscle. The pathway of this nerve is quite long, and consequently there are multiple locations along its path where it is susceptible to compression or traction injury. The primary function of the LTN is to provide motor innervation to the serratus anterior muscle. The serratus anterior muscle has several key functions. Its major function is to hold the scapula firmly against the thoracic rib cage. Consequently, when there is an interruption of motor stimulus to the serratus anterior, the common pattern of scapular “winging” is present. The serratus anterior also has another important role and that is upward rotation of the scapula. The movement of upward rotation is a key component of proper scapulothoracic mechanics. Later in this article I will highlight why this role of the serratus anterior is so important and what happens when muscle weakness from nerve impingement affects shoulder biomechanics. Damage or dysfunction can occur with the LTN from either excessive compression or tension although compression injuries are the most common. There are several locations where compression injuries are likely to occur. Compression could affect LTN roots at the cervical spine from herniated discs, bone spurs, tumors or other obstructions. Moving distally from the nerve root, the next location of potential compression is between the anterior and middle scalene muscles. The brachial plexus courses between the anterior and middle scalene muscles as this large nerve bundle exits the neck region. 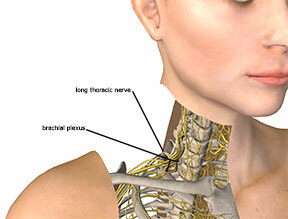 The LTN is directly adjacent to the major nerve bundles that comprise the brachial plexus. Often when there is a compression of the brachial plexus, the LTN may also be compressed but symptoms from other nerves of the brachial plexus likely dominate so LTN compression may go undetected. Other causes of nerve compression in this region include falls or blows directly on top of the shoulder, especially those that may include clavicular fracture.1 Heavy straps such as those in backpacks, knapsacks, shoulder bags, or even bra straps can also compress the nerve. If you are a massage therapist that carries your table around with a strap over your shoulder, this is something to consider. Rapid tensile loading on the nerve can also cause damage and dysfunction. The rapid stretch of the nerve is most common in sudden lateral flexion movements of the cervical region, such as those that happen in contact sports or in lateral whiplash injuries from automobile accidents.2 There are also some associations of LTN injury with sports activities that have a strong single arm dominance such as bowling, tennis, or golf. LTN injuries are most frequently associated with some activity. However, nerve compression can also occur from inactivity if the body is in a position that compresses the nerve for long periods. This could happen from awkward sleeping positions or postural strain from a challenging workstation or occupational activity. Proximity of long thoracic nerve to dorsal scapular nerve. As noted earlier, the LTN is the motor supply nerve for the serratus anterior muscle. The serratus anterior’s function was described as holding the scapula firmly against the thoracic rib cage and also contributing to upward rotation of the scapula. However this function of the serratus anterior should not be oversimplified because it plays a key role in scapulothoracic mechanics. When the shoulder is moved in abduction there is a coordinated movement between the scapula and humerus called the scapulo-humeral rhythm. This coordinated pattern is described so that for every 3 degrees of abduction, two of them occur at the glenohumeral joint and one at the scapulothoracic articulation. This coordinated movement allows the shoulder to abduct as fully as possible. The upward rotation of the scapula helps make a greater range of motion than would be possible with just glenohumeral abduction alone. In a situation of LTN compression, weakness of the serratus anterior means that full upward rotation of the scapula does not occur during abduction. Consequently, range of motion in abduction is diminished. However, when the scapula does not move in full upward rotation, the lateral edge of the humeral head is more likely to contact the underside of the acromion process during abduction, leading to shoulder impingement and potential damage to soft tissues in the subacromial region, including the bursa, supraspinatus, or joint capsule. Because the LTN is primarily a motor nerve, there are not many sensory fibers in the nerve. Consequently, the usual indicators of nerve compression such as sharp pain or paresthesia are not always present, or maybe diminished. Those with LTN injury may report weakness in the shoulder along with pain sensations. Keep in mind that shoulder pain could result from impingement problems that are directly caused by the biomechanical dysfunction. Attempting to address the shoulder impingement and not recognizing the contribution of the LTN involvement could lead to poor results and continual problems. Sometimes people describe weakness with various shoulder motions. The weakness might be accompanied with pain but could also occur without any pain or sensory deficit. The person may also describe some difficulty performing activities overhead as these motions usually involve a significant degree of scapular upward rotation to complete. As with any nerve compression or tension injury, the key factor for success is reducing the mechanical load. That means getting pressure off the nerve if it is a compression problem or relieving the excess tensile stress if it is a nerve traction injury. A thorough client history is extremely important in identifying the primary causative factors that may have led to nerve compression or tension injury. Keep in mind that especially with compression injuries, the longer the force has been applied to the nerve, the slower and longer will be the healing time. Nerve tissue heals very slowly, so it is not unusual for symptom relief to take many months or even a year or longer.6 During the healing process the person should avoid aggravating activities such as carrying heavy loads or continuing to have pressure on the shoulder from heavy straps. When compression has occurred from external forces such as heavy shoulder straps, removing the offending activity may be sufficient to reduce compression on the nerve. However, in many cases there still may be some soft tissue involvement which can benefit from massage in addressing the primary nerve compression or tension problems. There are a few key areas that are important to address to make sure the nerve has the greatest potential for proper healing. If LTN compression is occurring between the anterior and middle scalene muscles, it is often hypertonicity or taut bands within these muscles that are compressing the nerve. In those cases the key treatment goal is to reduce muscle tightness so that they do not further compress the nerve. However diving in with deep pressure on these muscles when they may already be tight can be counterproductive and cause more irritation to the nervous system. In many cases a light and gentle pressure on these muscles can be even more effective in helping restore proper tone. Begin with the client in a supine position. Turn the client’s head slightly to the opposite side and if possible laterally flex their head toward the affected side. This position will slightly shorten the scalene muscles so that there is not as much stretch tension perceived by the muscle. Place the fingertips of one hand near the superior portion of the muscle and the fingertips of the other hand near the inferior ends near the clavicle and first rib (Image 3). Apply a gentle pulling force separating your two hands and hold it for about two minutes. After holding that position, very slowly and gradually let go of the pulling force. By letting go of this force very slowly, it lets the brain adapt to a different sensation coming from the muscles and is more likely to have a longer lasting effect. After pressure is released, take the client’s head and just very slowly and gently move it back and forth in slight flexion and lateral flexion toward the affected side trying to keep from overstretching the muscles that have just been treated. These gentle and easy movement patterns help retrain the neuromuscular pattern perceived by the brain. If you’re not forcibly stretching the muscle, the brain does not have to perceive any potential tissue damage and will not cause as much reactive resistance to the movement. A similar technique can be applied to the muscles on the top of the shoulder along the path of the long thoracic nerve. 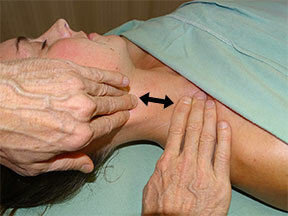 Place one hand near the base of the neck and the other hand near the distal end of the clavicle. Slightly laterally flex the client’s head toward the affected side. Apply a traction force to your hands gently pulling them apart and hold this for about two minutes (Image 4). At the end of that period very slowly and gently let go and once again move the neck and shoulder slowly and easily within a comfortable range of motion to help re-encourage safe and pain-free movement. Sometimes there may be bind and restriction in the lower portions of the long thoracic nerve. These restrictions can be addressed with the client in a side-lying position. Have the client hold one arm across the front of the body and use the other hand to keep the drape in place so the lateral aspect of the rib cage is accessible. With one or both hands push the surface layer of skin across the lateral rib cage and hold this position for a few moments (Image 5). After holding for a few moments slowly let go and now push in a slightly different direction (more superior or inferior). Pushing and pulling the skin perpendicular to the direction of the nerve will help to mobilize the nerve and make sure it is not being entrapped, bound or restricted by adjacent tissues (Image 6). When you begin to explore the anatomy of the nervous system it is clear that there are many more locations where nerves are vulnerable to excessive compression or tension than most of us realize. While stories of carpal tunnel, thoracic outlet or nerve root compression dominate most of the focus of nerve compression problems, there is a whole host of other disorders involving other nerve tissues throughout the body. We will explore more of these in future posts. Keenan KE, Skedros JG. A patient with clavicle fracture and recurrent scapular winging with spontaneous resolutions. Case Rep Orthop. 2012;2012:603726. doi:10.1155/2012/603726. Oma N, Alvi F, Srinivasan MS. An unusual presentation of whiplash injury: long thoracic and spinal accessory nerve injury. Eur Spine J. 2007;16 Suppl 3:275-277. doi:10.1007/s00586-007-0413-z. Skedros JG, Phippen CM, Langston TD, Mears CS, Trujillo AL, Miska RM. Complex Scapular Winging following Total Shoulder Arthroplasty in a Patient with Ehlers-Danlos Syndrome. Case Rep Orthop. 2015;2015:680252. doi:10.1155/2015/680252. Tsirikos AI, Al-Hourani K. Transient long thoracic nerve injury during posterior spinal fusion for adolescent idiopathic scoliosis: A report of two cases. Indian J Orthop. 2013;47(6):621-623. doi:10.4103/0019-5413.121595. Shilal P, Sarda RK, Chhetri K, Lama P, Tamang BK. Aberrant Dual Origin of the Dorsal Scapular Nerve and Its Communication with Long Thoracic Nerve: An Unusual Variation of the Brachial Plexus. J Clin Diagn Res. 2015;9(6):AD01-AD02. doi:10.7860/JCDR/2015/13620.6027. Pecina M, Markiewitz A, Krmpotic-Nemanic J. Tunnel Syndromes: Peripheral Nerve Compression Syndromes. Boca Raton: CRC Press; 2001.